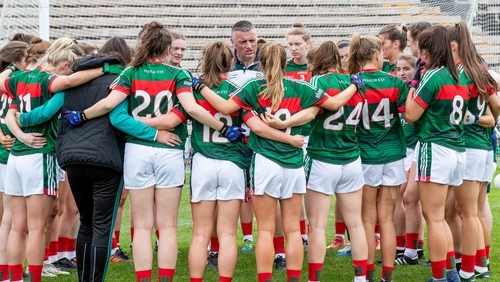 Mayo ladies manager Peter Leahy says some of the accusations around the player walkout are "close to slanderous". The saga surrounding the July withdrawal of 12 players, eight from Carnacon and four others, from the county team has refused to go away with Cora Staunton last week stating that the environment was unsafe. The remaining members of the panel subsequently released a statement backing the management saying: "We believe that no player welfare issues exist or have ever existed under the current management." The allegation of putting players' welfare into jeopardy against him and his management team has forced him to break his silence, he says. "The word unsafe is the reason why I am [speaking out]," Leahy told the GAA Hour podcast. "The minute safety was brought into it I had to protect my management team. Safety and unhealthy was mentioned last week, enough is enough. "There’s a chartered physio at every single training session, we’ve heart-rate monitoring, we have stuff that no other inter-county team has. "We’ve a fully qualified strength and conditioning coach. "For this to come out as a welfare [issue] and unsafe...this puts everything into question. "We’ve a teacher as a selector, we’ve a pilot as one of our selectors, we have a bank official. "We have all these people who are now [being questioned] as to unsafe. "We’ve a liaison officer there and if there’s an unsafe situation has to be contacted but she has never heard a word about safe or unhealthy. "These are close to slanderous accusations being put out there and it’s not fair on my management team." The Carnacon players originally cited "player welfare" as a reason for leaving, and Staunton later said: "The environment for us wasn’t right within the county set-up, we didn’t feel it was a safe environment to be in so we decided to leave." Carnacon had been thrown out of the Mayo championship for bringing the game into disrepute before being reinstated following an appeal. Leahy believes that certain players were unhappy with selection issues and attempted a power play where the choice was to back the players threatening to leave or back the manager. He detailed what came out of one-on-one meetings before the walk-out: "Some of the players weren't happy with my selection, simple as that," he said. "We only had nine players from the All-Ireland last year playing, that was a problem to a lot of them. In my opinion it's not a problem, it's whoever is the best goes on the pitch on the day." At a subsequent meeting with the Carnacon players, Leahy said that some of the falling out came down to hurt feelings. "We were supposed to have a five minute chat with the Carnacon girls, it ended up lasting the full training session," he said. "It was 'oh my feelings are hurt’. It was a feelings situation." Leahy added that some of the remaining players were pressured to leave the panel ahead of their championship game with Cavan. He said: "We had girls who still remained on the panel who two or three days before we played Cavan were asked to leave, to join them, ‘oh, if you go they won’t be able to field', so this is the kind of stuff that was going on, which is cloak and dagger stuff, it’s not nice, it doesn’t reflect well." Neither Carnacon or Cora Staunton could be reached for comment.